In the three months ending December 2017, Apple saw a healthy increase in market share in key markets, lead by the iPhone X. 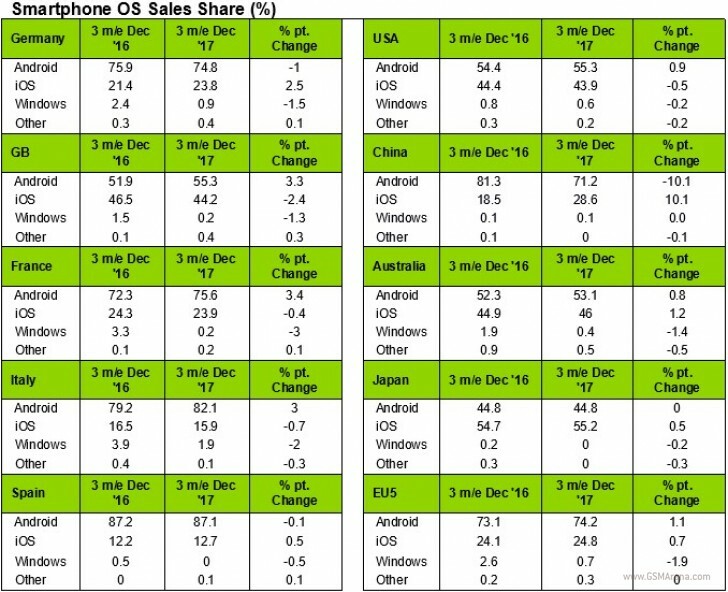 Despite slowing sales in the US, the UK, France and Italy, Apple saw an increase in Spain, Germany, Australia, Japan and mostly China, where its market share grew 10.1 percentage points to reach 28.6%. In the US Apple and Samsung accounted for 70.8% of Q4's total smartphone sales. Huawei, which was hit by a carrier deal falling through, saw its meager 0.4% market share stay flat. Samsung remained the top smartphone vendor in Q4 of 2017. In Europe, Samsung saw its sales share grow 2.2 percentage points to 31.3%. Finally, during the final quarter of the year and the Holiday Season in the US, 96% of iPhone owners bought another model from Apple.